Affiliations: (formerly) "The Great One"
Powers/Abilities: None. Although an alien, "Kyrkalin" could pass for a human, his only distinguishing features (which he shared with others of his race) being the unusual facial structure around his eyes, brows, and cheekbones. 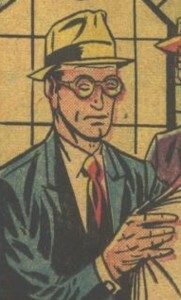 When he later assumed his "George Brewer" identity, he wore a partial facemask and glasses to hide his true features. 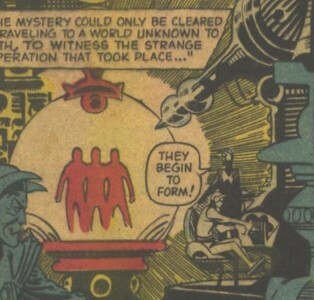 History: (Journey Into Mystery I#50/2 (fb) - BTS) - Five years earlier, "Kyrkalin" and two other alien explorers were transported to Earth via a teleportation machine to make a study of the planet's land, sea, and air for their leader ("The Great One"). They each set up identities for themselves in various career fields, one specializing in geology, one in oceanography, and one in meteorology. (Journey Into Mystery I#50/2) - A team of deep-sea divers were exploring the ocean depths when one of them suddenly disappeared, leaving only his empty diving suit behind. A meteorological team of two men went up into the stratosphere in a sealed gondola on a high-altitude balloon, when one suddenly disappeared. A team of three geologists were exploring a deep cave. As the team was climbing up and out of the cave, the man in the middle of the rope-line suddenly disappeared. The F.B.I. was conducting an investigation of the three who vanished, but agents found out that the men's records only went back five years -- before that, there was nothing known about them. Looking at photos of the missing men's faces, the agents also noticed that all three shared the same strange type of eyes, brows, and cheek structure, which went beyond coincidence. The three explorers were teleported back to their home world to report the intelligence they had gathered to "The Great One," who decided Earth would be excellent for colonization. "The Great One" showed the three the weapons that he had amassed for conquest. Earthlings would be enslaved and put to work mining the deadly ore for the aliens' central power plant, and any resistance would be wiped out, totally and ruthlessly. "Kyrkalin" was greatly disturbed at hearing this -- he had thought that his mission would be for a peaceful union of worlds for mutual benefits, and he kept remembering the happy, wonderful times he shared with Earthlings and had grown quite fond of the way of life on Earth. Later that night, realizing what he must do, "Kyrkalin" overpowered a guard and went into the planet's central power plant, which he overloaded and caused to explode. The aliens had to convert all weapon energy over to just meeting their normal daily needs. As the power plant was damaged beyond repair, "The Great One" abandoned his plans for Earth because it would take a lifetime to repair the power plant. But the suspected saboteur, "Kyrkalin," was believed to have been killed in the explosion. (Journey Into Mystery I#50/2 - BTS) - Secretly, "Kyrkalin" teleported back to Earth and assumed the alias of "George Brewer". 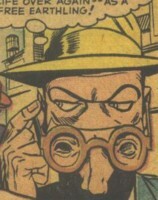 (Journey Into Mystery I#50/2) - "George Brewer" was standing on a street corner, reading a newspaper story about the three who vanished, when he was approached by a man on the street who thought that the whole story of the mysterious disappearances was only "bunk" -- just a publicity stunt for a science fiction movie. But "George" knew the truth behind the story, and he was ready to start his life over again -- as a free Earthling. Another case of where the characters on the cover (by Joe Sinnott) don't resemble the characters in the story. It's difficult to distinguish in the story which one of the three explorers was "Kyrkalin" since there are no pictures that clearly identify which one of the three he was -- while he was thinking his true thoughts, only a close-up of his eyes is featured in the panels. I took some liberties in naming this character, who was never actually named in the story (the only name even mentioned therein was "The Great One"). When I saw his human identity wearing a blue suit and glasses and reading a newspaper, I immediately thought "...strange visitor from another planet..." disguised as a "mild-mannered" human, so I based his human name, "George Brewer," on the birthname of George Reeves (the actor who starred on the "Superman" TV series of the 1950s), and I based his alien name, "Kyrkalin," on Kirk Alyn (the actor who played Superman in the movies in the 1940s)...but of course, there was no indication shown in the story that "Kyrkalin" had any "...powers and abilities far beyond those of mortal men". "Kyrkalin" reminded me of Velmax -- the Skrull who was stranded on Earth in 1947, renounced his allegiance to the Skrull Empire, established a human identity, became the superhero Effigy, and actually liked living amongst humans (as seen in Marvel: The Lost Generation). The despotic ruler of an alien race that teleported three of his scouts to Earth to gather information about the planet's environment. Upon receiving the information, he declared Earth would be a perfect world to conquer for colonization. When "Kyrkalin" learned of "The Great One's" true intentions, he put a stop to his plans by overloading the planet's central power plant, causing it to explode. 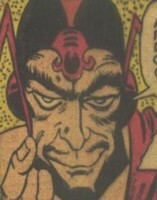 "The Great One" then had to abandon his invasion plans and focus the energy resources of his weapons to meeting his world's daily energy needs. Used to transport three aliens to Earth for their reconnaissance mission and to transport them back to their home world at the end of the mission. "Kyrkalin" later used it to transport himself back to Earth permanently, where he began his new life as an Earthling.